Whether intentionally or intuitively, writers make format and content choices for each given document situation. Every document situation is unique and deserves analysis of the context, audience, and purpose so that the writers may make considered and appropriate decisions about form and content. Actually writing out the analysis information is vital for novice writers and for collaborative projects. 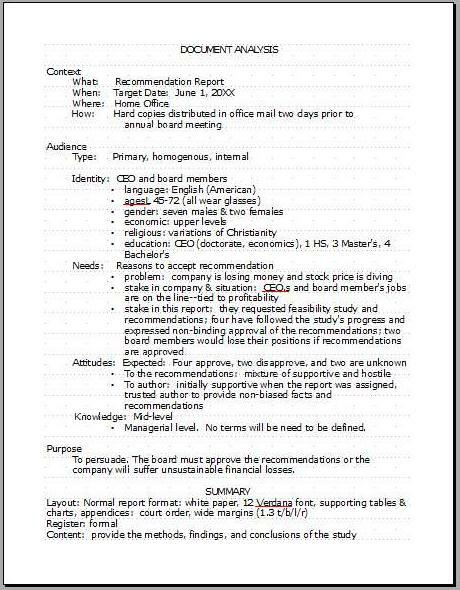 The following image illustrates a basic document analysis that serves as a starting point for creating a document plan. This level of analysis may not be enough for a major project. In that case, the writing team would spend more time and thought on developing a complete picture of their document situation. Notice that an analysis covers journalism's basics, the five W's and an H. For Who, we use the term, audience and for Why we use the term purpose. According to an expert on document design, Karen Schriver (1997), three methods of conducting an audience analysis are commonly used. The classification method. Using this method, a design team constructs a profile of the intended audience by brainstorming. Audience characteristics are listed such as: age, gender, educational background, cultural and language background, religion, economic class, hobbies, etc. The design team adjusts the document's register, style, use of graphics, and other layout matters according to what seems appropriate for this invented audience. The intuition method. Using this method, a design team constructs a profile of the intended audience based on their personal experiences with the topic and the experiences with people they know who fit the rough profile of the intended audience. The design team uses role playing to imagine themselves as the audience, and then they use the information gained to construct a document plan that would work for the imagined audience. The listening method. Using this method, a design team interviews and observes potential audience members to learn about their needs, their level of experience with the subject, their ways of accessing information, etc. The design team then constructs a draft based on what they learn. The team then tests the draft with other potential members of the audience and makes additional revisions based on the facts of the tests. No one, to date, claims that these methods are exhaustive. Nor does anyone claim that one of these methods is always right. Sometimes time/cost/purpose considerations dictate one method rather than another. Sometimes, some combination of two or three methods are appropriate. What are some examples of writers misjudging some elements of their document situation? What are the consequences of that misjudgement? Next visit the pages CONTEXT, AUDIENCE, or PURPOSE.